Discard over blemished olives. Make three evenly spaced lengthways cut into each olive, cutting through to the stone. Place olives in a sterilised jar (2 litre capacity) until two-thirds full; cover olives with water. Fill a small plastic bag with water, sit bag on top of olives in jar to keep olives submerged. (it is quite normal for scum to form on the surface of the water). Refill jar with clean water daily. Continue changing water until olives are ready to be pickled. Olives are ready to be pickled when they don’t taste bitter. Test Black olives after 7 days & Green olives after 12 days. If olives are still bitter then continue daily water change until the bitterness is gone. Combine sea salt and 4 cups of water in a pan, stirring over heat until salt is dissolved; cool to room temperature. Drain water from jar, pour in enough salted water to cover olives. Pour olive oil into jar to completely cover the waters surface and make jar airtight. Note: if kept for several months the oil may form a skin over the surface of the water. Remove skin and recover with olive oil for longer keeping. heat peanut oil and fry onions, garlic, ginger and one kaffir lime leaf until onion is transparent. add red curry paste and galangal powder and cook on a low heat for 15 minutes, stirring regularly. add pork and cook on medium heat until pork changes colour. now add coconut cream, fish sauce and sugar, simmer for 1 hour or until pork is tender. Skim off any excess oil. add salt to taste, lime juice and remaining kaffir lime leaves and simmer for a further 10 minutes. serve with jasmine rice or Asian noodles. Note* if you have a bumper crop of cumquats, double the quantities. Wash and slice fruit finely and remove seeds. Place the fruit in a large saucepan, cover with water and soak overnight (or for around 8 hours). Put the seeds in a separate container (such as a cup) and soak in a small amount of boiling water. Leave overnight. Next day strain the liquid from the seeds. Discard the seeds and add the water to the cumquats. Cook gently on a low heat until the fruit is tender and the liquid is reduced by half. Add the sugar and lemon juice. When all the sugar has dissolved, turn up the heat and boil rapidly until the mixture jells (around 30-45 minutes). Note: stir often, or the marmalade will burn! To test if the marmalade is jelling, spoon a little onto a cold saucer. If a skin forms, and it glazes on the surface and wrinkles when touched, it is ready. If it is still runny, boil for a little longer and test again. Lightly grease a 2cm-deep, 24cm (base) loose-based round flat pan. Combine biscuit crumbs, cinnamon, nutmeg and butter in a bowl. Press into base and sides of prepared pan. Refrigerate for 1 hour. Make lemon curd: finely grate rind of 1 lemon. Juice all lemon. Whisk eggs and sugar together in a heatproof bowl until well combined. Add lemon rind and 2/3 cup lemon juice, whisking constantly until well combined. Place bowl over a saucepan of simmering water (do not allow base to touch water). Cook, stirring with a wooden spoon, for 20 to 25 minutes or until thick and custard-like. Do not allow to boil. Remove from heat and whisk in butter. Pour lemon curd into chilled tart case. Cover with plastic wrap and refrigerate overnight. Winter is a great time for warming up with some great citrus favourites. 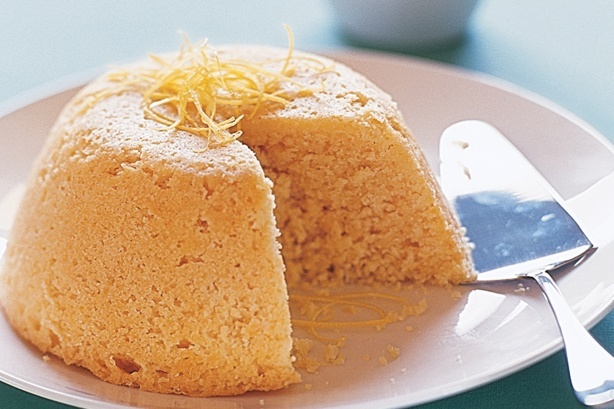 One of our favourites is moist Lemon Steamed Pudding.